This sample image is based on an original design by Yiying Lu. 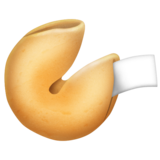 This is how the 🥠 Fortune Cookie emoji appears on Emojipedia 5.0. It may appear differently on other platforms.